Donna de Varona – an Olympic swimmer, Emmy-winning television sportscaster and tireless advocate for women in sports – recently was presented the United States Sports Academy’s 2016 Theodore Roosevelt Meritorious Achievement Award at the U.S. Olympic Committee’s New York City offices by Academy Trustees Joe Szlavik, right, and Peter Tichansky. DAPHNE, Ala. – Donna de Varona – an Olympic swimmer, Emmy-winning television sportscaster and tireless advocate for women in sports – has been named the winner of the United States Sports Academy’s 2016 Theodore Roosevelt Meritorious Achievement Award. The Theodore Roosevelt Meritorious Achievement Award is presented to an individual in any amateur or professional sport, past or present, who has excelled as a contributor to both sport and society over at least a decade. 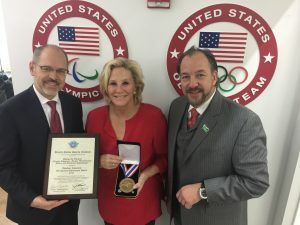 De Varona recently was presented the award at the U.S. Olympic Committee’s New York City offices by Academy Trustees Joe Szlavik and Peter Tichansky. Szlavik is President of Scribe Strategies & Advisors, Inc., and Tichansky is Chief Executive Officer of the Business Council for International Understanding. As the first president of the Women’s Sports Foundation, de Varona has been an influential figure in the world of sport. She served five terms on the President’s Council on Physical Fitness and Sports and was a pivotal force behind the passage of Title IX legislation, which barred sexual discrimination in any education program or activity receiving federal financial assistance. Since then she has been involved in numerous programs to support the expansion of women’s sports. De Varona was influential in passage of the the 1978 Amateur Sports Act, which restructured how Olympic sports are governed in the United States. She helped with the establishment and funding for both the United States Anti-Doping Agency and the World Anti-Doping Agency, which are entrusted with eradicating the use of illegal substances to enhance performance in sports. From 1997 to 1999, de Varona chaired the organizing committee for the Women’s World Cup Soccer Tournament. In 1999, Sports Illustrated for Women ranked her on its list of the “100 Greatest Athletes.” In 2003, the National Collegiate Athletic Association (NCAA) awarded her its Theodore Roosevelt Award. De Varona serves on the executive board of Special Olympics International and is a member of the International Olympic Committee’s Women and Sports Commission. She serves on the United States Department of State’s Empowerment of Girls and Women through Sports Council. In 1960, at age 13, de Varona qualified for her first United States Olympic team, making her the youngest Olympian that year. In the 1964 Summer Olympics in Tokyo, she won gold in the women’s 400 meter individual medley and won gold as a member of the U.S. 4×100 meter freestyle relay team. Between 1960 and 1964 de Varona broke 18 swimming world records and by age 17 she was voted the Most Outstanding Female Athlete by both the Associated Press and the United Press International. Despite her success in the pool, de Varona retired from professional swimming following the 1964 Olympic Games after she was unable to obtain a college scholarship for swimming because there were few collegiate athletic opportunities for women at the time. She graduated in political science at the University of California Los Angeles (UCLA). She graced the cover of Sports Illustrated, Look and Life magazines and appeared on ABC’s Wide World of Sports as a 17-year-old in 1964, soon becoming one of the first female sportscasters for a national network. She signed a contract with ABC at age 18 and became a host, special reporter and analyst for some of the network’s top programs. De Varona earned an Emmy Award nomination for “Keepers of the Flame,” a televised special on the Olympics, and won the Gracie Award twice for her Sporting News Radio show “Donna de Varona on Sports.” In 1991 she won an Emmy Award for her coverage of an athlete competing in the Special Olympics. De Varona served as the late night host for the 1984 Olympics and anchored the Los Angeles Olympics as a play-by-play announcer with Jim Lampley for synchronized swimming and women’s swimming events. In 2000, when de Varona covered her 12th Olympic Games, the International Olympic Committee presented her with the Olympic Order, its highest award. She was inducted to the International Swimming Hall of Fame as an “Honor Swimmer” in 1969. In 2004, de Varona was inducted into the Women’s Hall of Fame in Seneca Falls, New York. The Theodore Roosevelt Meritorious Achievement Award is part of the United States Sports Academy’s Awards of Sport, which each year serve as “A Tribute to the Artist and the Athlete.” The Academy presents the awards to pay tribute to those who made significant contributions to sport, in categories as diverse as the artist and the athlete in several different arenas of sport.